It’s not something you see every day, so when you do, you’ll definitely need to do a double take – one glance for each level. Popular local vegan eatery Buddha-Full Cafe has unveiled its stunning new addition to the family: the Buddha-Bus. Found “deep in the forest of Sooke on Vancouver Island,” this refurbished 1965 London double-decker bus will feature a 100% plant-based menu with gluten-free and refined sugar-free items too. Using organic and seasonal produce from BC, this epic-looking new bus even boasts a second-level long table where guests can chow down. Starting this spring the Buddha-Bus will be available for booking for personal events like weddings and bigger shindigs such as festivals, pop-ups, workshops, and markets too. 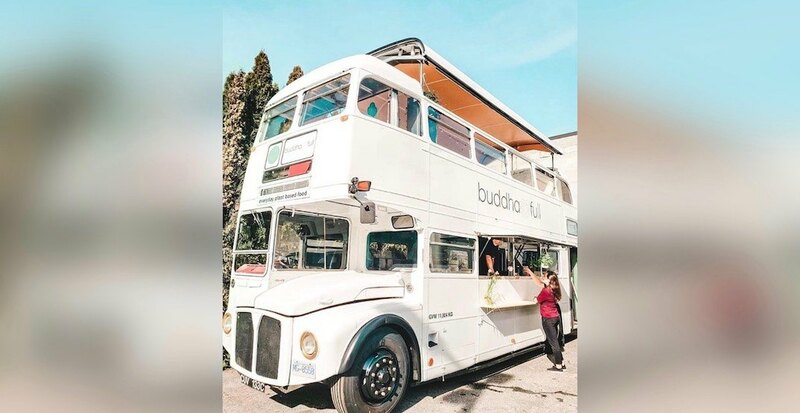 The new bus adds to Buddha-full’s existing cafe locations in Lower Lonsdale (106 West 1st Street, North Vancouver) and Northwoods Village (102-2120 Dollarton Highway, North Vancouver).